Artful Affirmations: Tea Cup Tuesday and a Surprise for me. Today is Tea Cup Tuesday again....wow, is time flying by for all of you as well? What a gorgeous summer we are entering. There are so many wonderful things to see and do. Out on my walk this morning I couldn't help but be appreciative of the beautiful green colors all around me. Green is such a healing color. Stunning in the early morning sunshine. The cup I am sharing today I bought last week while in Baltimore. (Yep, I was home for less than 48 hours and then needed to drive to Baltimore...). The best most enjoyable part of this quick trip was stopping by two antique shops. And this cup was waiting for me at one of them. This cup was my surprise! It has an uncanny similarity to the cups that were on display at Versailles as having been used by Marie Antoinette herself! The reproductions that were available at the shoppe were very expensive, as in $200-500! I did not bring one of those home, although I really wished I could! 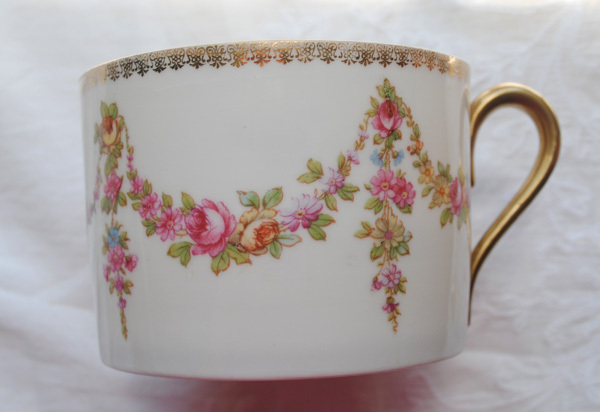 Instead, waiting for me in this antique shop was this cup above, with the similar cup shape, and boughs of roses! I was delighted to find it. 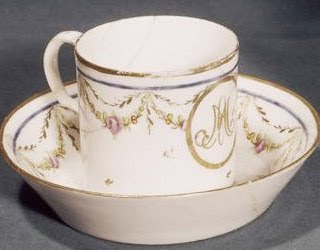 This cup is from Marie's traveling case (above). And one of the cups they reproduced. There were several styles to choose from and this was the only one I could find an image for. O.k.... maybe it is not that similar...but it is close enough for me. Lol! I am in love with the colors and the flowers! There are only a few little marks on the cup. And these two gold lines plus an imprinted 1 and a three digit number beginning with 6. 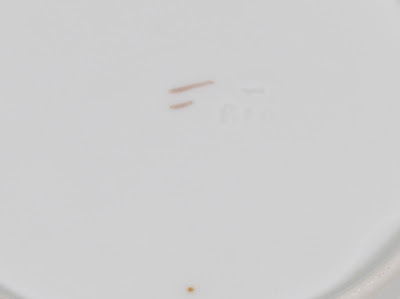 I have been looking for information online as to how to figure out where or when a cup was made when it doesn't have a name or backstamp on it. Below is a sample of things I brought home from Paris that I am giving away next French Friday. I haven't finished putting it together yet, so this is a little sneak preview. I am thrilled that you stopped by for Tea Cup Tuesday. Martha at Martha's Favorites and I really enjoy hosting this day of ooogling other's gorgeous china! If you have a tea cup you would like to share with us, create your post and then sign up below by filling in the two blanks. We would love to come over and visit you as well. Hi Terri...simply beautiful!! Gorgeous! Wow..it must have been so fun to admire all these fancy cups in France!This is a beautiful surprise.. yay! Happy tea time! Terri, your teacup is stunning! What a wonderful surprise! Apparently you were supposed to stop by that shoppe to find that cup and saucer. Busy girl, you! Paris AND Baltimore. Thanks for the postcard, by the way. It's on my table so I see it everyday. Hi Terri, that cup you purchased is gorgeous!! I like it much better than the more expensive one :) They both have a swagged effect, but this one has more pretty flowers to see. Your cup is such beautiful as Maria Antonieta's...really I like more yours ,those flowers and colors...lovely . What a beautiful teacup! And what a wonderful gift to yourself!! Thank you for stopping by my first Teacup Tuesday post and for co-hosting this lovely party with Martha. I LOVE seeing all the gorgeous teacups. Yours is indeed lovely. I love the "swag" appearance of the flowers. I'm with you on green being a healing color. That's part of the reason I don't deal well with winter. We moved from a climate where it's always green (Florida) to a place where we experience winter (leafless trees), and the lack of green has been nearly impossible for me to adjust to. I find green to be soothing to the soul. Blessings to you and a huge thank you again for being such a gracious hostess. So pretty! French Friday, what a great idea!! I can hardly wait to see what you make! Just popping in to say hello....I'm not linked to Tea Cup Tuesday this week..still got lots of projects to finish in the house. We finally decided we would NOT stop until this place is finally put together...Thomas was gone most of the time last year so we are having fun getting it all finished. So my blogging is much less which I really miss...I wanted to ask if you are signed up for Karen's party "Where Bloggers Create II". It was so much last year even though I was in the remodeling stage in my studio. This year will be a blast...hope you are or will join us. How pretty and what a great find. Your teacup is so gorgeous and just as beautiful as Maries was!!! It was meant to find YOU!! How great. Oh La La, would I love to win something you brought back from Paris. 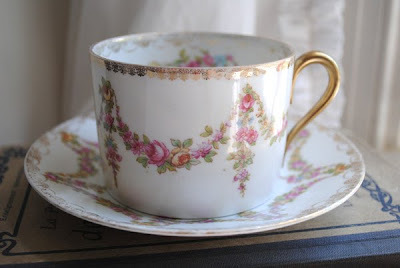 Be sure to check out my teacup for Teacup Tuesday. The tea cup is sooo gorgeous!! Thanks for sharing it with us. Thanks also for hosting TCT, I'm joining in this time! 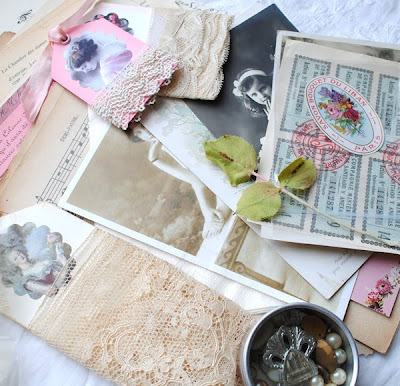 So lovely - I really love that teacup, Terri! Thank you, thank you for the postcard from Paris - you are so sweet. It is proudly displayed on the ribbon board here in the apartment. I like the cup and saucer you bought and you are the queen of your own home so drink from it royally. Nice to join you for tea. What a wonderful trip you must have had. Your teacup is super sweet! I'm glad you were able to bring it back home with you. Thanks for sharing and thanks for visiting me too. Have a wonderful week. What beautiful teacups Terri! The new and the old! Of course Marie would not have anything that wasnt beautiful would she! Oh lala a French Giveaway! What sweet things I see!!! I like your cup more than Marie Antoinette's! It's so delicate and the colors just make me smile! This tea cup is awesome. I had to laugh that it was just waiting on you. I bet it called your name as you walked into the antique store. Isn't it fun when you actually find something you really like and it reminds you of this fantastic trip? And all those goodies from Paris made me smile. I think the cups do look alike. What a beautiful cup you have found anyway. Have a great week. I think your antique shop purchase was a gem. And what a difference in price, well worth buying and displaying! I am interested in anything you find out about unmarked teacups. Thank-you for hosting this day, I am having a blast with it! What a lovely cup, Terri! What artists they are, designing and decorating our teacups this way. Hello Terri- I’m so happy you found this set. I know it’s been said, but I like it better than the other one as well. I have several teacups that have no marks stamped on them and have lost their stickers. If you find any information out on how to identify them please post the links or e-mail them to me. I would be most interested. Thank you and take care. Pretty set but honestly I have no idea what the marks mean??? I have several that have no marks. Thanks for sharing. Terri a special thanks to you and Martha for hosting this very fun Tuesday for all of us to enjoy! Your beautiful tea cup was sure a special find! I've enjoyed your very beautiful pictures from France. Thanks for bringing us along for the tour! Terry, what an amazing similarity! It was meant for you to find it! I think you are right. This sweet teacup was waiting for you! Absolutely stunning. I love the colours too. Look forward to French Friday. If you have time for tea please drop in. the cups are gorgeous...and then all the goodies at the end...well what can be said but one very descriptive and all encompasing word? Y U M M Y !!! I just found your blog and I'm adding it to my favorites. I loved your pictures of the Paris flea market. So many wonderful things...I would have been broke! What a lovely theacup, I have been many times in France but I've never seen such a beautiful theacup. I like your blog and I'm going to follow you and you are welcome at my blog of course. Welcome back home Terri!! I so enjoyed being able to visit Paris once again through your eyes. I don't blame you for heading off to Baltimore so soon after your return. What fabulous cups you found. Just beautiful!! Thank you and Martha too for being our lovely hostesses this Tea Cup Tuesday!! What a beautiful teacup! I LOVE the colors of the flowers...just beautiful. I did not realize that you and Martha hosted Teacup Tuesday together. Thank you so much for hosting :) I apologize for not mentioning and thanking you as well in my first post today. 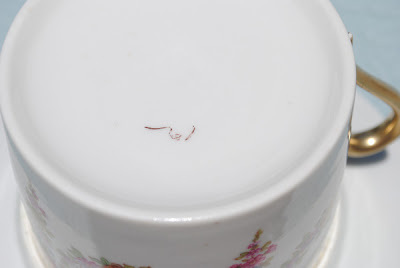 Oh what an exquisite little teacup, it had your name on it and was ready to go home with you! Don't you just love it when that happens! Love your special gift to yourself, the best of kinds when it's a teacup, in my mind! Wow I popped over to say hello and got so sidetracked on your tutorials and beautiful blog! So nice to meet you... I am going to be trying the flowers soon! Oh Terri what a gorgeous cup you have shared and yes I can see how it is so similar to the Marie Cup!! and why you love it so!! I still didn't get to play again with TCT as now I have pneumonia and just couldn't bear to fight with the camera ... but will play again soon I promise! I was just too miserable this week.. I'm not showing off my cups at the moment but a enw tablescaping of a wedding table(including a mannequin dressed in a home made wedding dress plus a wedding table of presentation and the bride and groom's table) so you are welcome to come and visit me ! 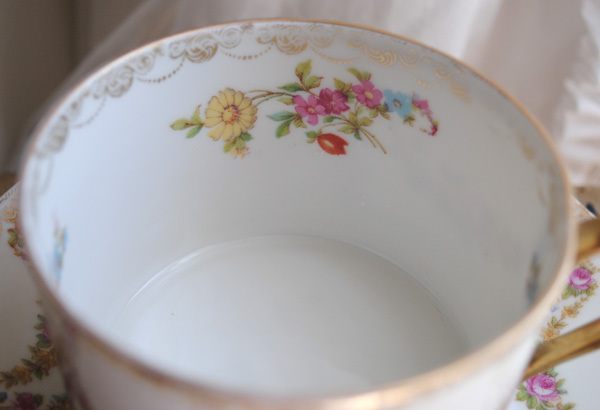 Your tea cup is every bit as pretty and just think of the money you saved for more tea cups! What a pretty teacup! Those dainty floral boughs are lovely. Hmmm... $200 - $500 for a reproduction! Well... I love the one you did come home with. Thank you for stopping by and hosting this fun event! Hugs! Thank you so much for your inspiration. I have made a elegant shoe for my mother and she liked the surprise very much! She is going to try to make some herself. I am from Balto. County, now live on the Eastern Shore of Maryland. 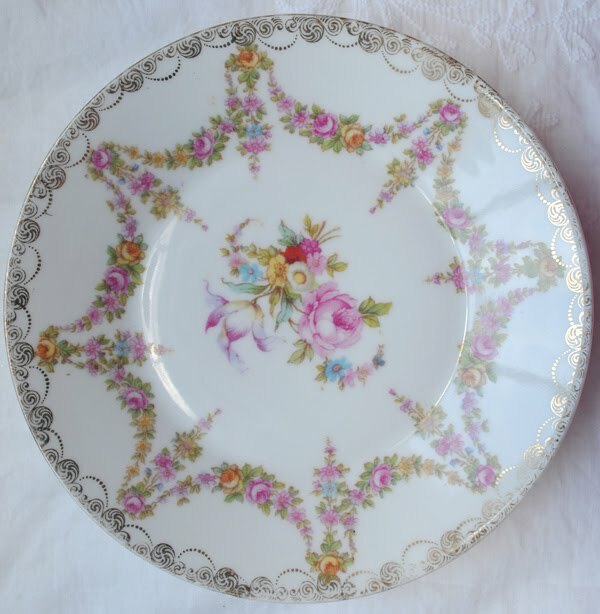 Love your teacup find and wow, those repros were gorgeous too. Can you imagine having a real one? I wonder if any survived? I will have to join your Teacup Tuesday one week soon. Have lots that I love too. Your teacup is beautiful. I really love the shape and those dainty rose swags. I like the tea cup you picked up in Baltimore better than the repo. It's lovely. What beautiful teacups those are! How fun it must have been for you to visit France. I'm very ready to go back for another visit. See you on Teacup Tuesday. Thanks for sharing. Totally similar with those lovely swags of flowers!